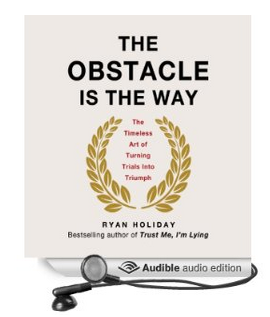 For the many of you who asked, I can now proudly announce that the audiobook edition of The Obstacle Is The Way is now available. And there’s an exciting piece of news about it that I’ve kept secret until now: Tim Ferriss is publishing it. Tim and I spent some time in Amsterdam in 2013 when I was finishing the book and I showed him a copy of the manuscript. He liked it so much that he went straight to my publisher, Portfolio/Penguin and bought the rights for the audio edition. This was an ideal collaboration because not only did Tim give excellent notes on the book that helped improve it, but his massive distribution network helps put the book in front of lots of new people. As his May selection for the Tim Ferriss Book Club, The Obstacle Is The Way will get all sorts of new readers I could have never expected otherwise. It’s all very fitting because Tim and I first connected over our love of Seneca back in 2007. Tim was the one who prompted me to write this post on stoicism for his blog in 2009, which resulted in my first inquiry from a book publisher. It was then that I realized I might be able to actually pursue this all as a career. And now here we are publishing a book together. Anyway, enjoy. You can also listen to this podcast that Tim and I did about the book (which tied with James Altucher’s podcast was one of the most fun and thought provoking interviews I have ever done). Those are 2 of the 3 podcasts I’ve re-ear’d ever – awesome stuff! You’ve helped reframe stoicism in a way that Taleb couldn’t even do for me. Maybe this isn’t the place for it, but: Have you ever dedicated yourself to a philosophy other than Stoicism? Ryan, do you find it better to read books on the same subject one after the other (full-immersion) or spacing them eg. stoicism-noir-stoicism-animals-stoicism etc?? Heard you on TF podcast…..you are f-ing amazing…..am now going to begin reading some of your rec. You inspired the hell out of me….thanks! Ryan, I listened to your podcast with Tim today; I was blown away by the wealth of information among so many great topics, thank you! I’m heading to Rome in a couple weeks (hmm, should I get Letters from a Stoic or Meditations for the trip over), and you said you visited some sites there, any must-see’s?